Departing President Barack Obama and incoming President Donald Trump in the Oval Office. The election of U.S. President Donald Trump has effectively reversed eight years of American policy toward Israel and Palestinians, in which former President Barack Obama called for “daylight” between the United States and Israel on key issues, staunchly criticized Israeli settlement building, and held in contempt Israeli Prime Minister Benjamin Netanyahu. This reversal of policy has been among the most important of the various factors that are shifting European views toward Israel. Since taking office, Trump moved the U.S. embassy from Tel Aviv to Jerusalem, following through on bipartisan U.S. legislation requiring the move, initially passed into law in 1995 during the presidency of Bill Clinton. Trump pulled the United States out of the Iran deal. The U.S. Congress passed the Taylor Force Act, requiring the United States to cease foreign aid to the Palestinian Authority so long as terrorists and families of so-called martyrs continue to receive financial stipends for their acts of terror. The United States similarly cut funding to UNRWA (United Nations Relief and Works Agency for Palestine Refugees) by $300 million, and pulled out of UNESCO and the UN Human Rights Council, over the agencies’ actions to distort truths and harm Israel’s standing within the international community. Trump appointed a staunch defender of Israel, Nikki Haley, as U.S. Ambassador to the United Nations. And President Trump publicly called into question the long-held view that the preferred solution to the Israeli-Palestinian conflict is a two-state solution. These major policy shifts have eliminated any such “daylight” created during the previous U.S. administration and have reaffirmed Israel’s place as America’s staunchest ally. Yet, the impact of the Trump administration’s moves can be felt well beyond the borders of both the United States and Israel. Europe has had little choice but to adapt to America’s new Middle Eastern policies. Trump’s positive stance toward Israel, Israel’s newly discovered natural gas resources, as well as nationalistic sentiments gaining popularity throughout Europe – most notably the Brexit – have all caused European nations to reconsider their approaches toward Israel. Former U.S. President Barack Obama’s views toward Israel and the Middle East were often aligned with prevailing European views. Obama openly questioned Israel’s willingness to enter into a peace agreement with the Palestinian Authority – whom he and Europe view as a legitimate peace partner despite decades of incitement to terror and the refusal to acknowledge Israel as the national homeland of the Jewish people. Israelis significantly doubt the Palestinian Authority’s willingness or ability to reach a meaningful and lasting peace accommodation with Israel. Following Israel’s unilateral withdrawal from the Gaza Strip in 2005, Israelis fear that any withdrawal from portions of the West Bank, which closely border Israeli population centers in the greater Tel Aviv region and Jerusalem, would lead to instability, increased terror, and Jew-hatred. Furthermore, the social costs of withdrawal from lands with well over 300,000 Jewish residents, on sites that are central to Israel’s ancient Biblical narrative, would be too enormous a cost for the flimsy prospects of peace. Despite Israeli sentiments, Obama pushed forward a peace plan toward the end of his presidency in 2014. Obama warned Israel of the dire consequences of failing to reach a final peace accord with Palestinians, the primary among those threats being Israel’s “isolation” from the international community. Recognizing Israeli hesitancy, the United States looked to Europe and the United Nations to provide diplomatic leverage. Then-U.S. Secretary of State John Kerry held talks in late 2014 with Palestinian negotiator Saeb Erekat and European leaders in Rome, just weeks after France’s Parliament voted symbolically to recognize Palestinian statehood. Similar resolutions were passed in the prior weeks by the British and Spanish parliaments. These local resolutions passed with the full support of – if not backchannel promotion by – the Obama Administration. Simultaneously, the United States threatened not to veto European-backed resolutions supporting an independent Palestinian state at the United Nations. Yet, the threats did not push Israeli Prime Minister Benjamin Netanyahu closer to an accord. Rather, Netanyahu embarked on a campaign to improve relations with major powers and smaller nations around the world. Recognizing that the United States and EU member-states might not be counted on as long-term Israeli allies, Netanyahu – acting as both Israel’s prime minister and foreign minister – worked to improve relations with world powers Russia, China, India, Japan, Canada, and Australia. Additionally, he strengthened ties with nations in South America, Africa, and Eastern Europe. The result is that the Obama doctrine failed to isolate Israel. Today, Israel has more friends and allies than in any time in its history. After Obama and Kerry’s peace initiative failed, in the final days of the Obama administration, the UN Security Council passed Resolution 2334 condemning Israel’s settlement activity, calling Jewish communities in the Biblical regions of Judea and Samaria a “flagrant violation” of international law. Then-U.S. Ambassador to the United Nations Samantha Power – an Obama appointee – abstained from the vote, failing to use the U.S. Security Council veto and allowing the passage of the resolution. Historically, the United States blocked resolutions in the UN Security Council that were considered anti-Israel. Israel was worried that the near-automatic veto provided by the United States would eventually disappear under the Obama administration. Indeed, the United States chose to allow the resolution’s passage as a parting shot, just days before the Trump administration was to be inaugurated. Both the United States and Israel viewed the passage of the law as a punishment for rejecting the failed peace initiative. In appointing South Carolina Governor Nikki Haley as U.S. Ambassador to the United Nations, President Trump sought to restore America’s longstanding defense of Israel at the United Nations. Haley spoke out against the passage of UNSC Resolution 2334, calling the vote’s passage “a stain on America’s conscience” and an “impediment” to peace. Recognizing that Trump is not as keen on promoting a two-state solution as his predecessor (so long as Israel is not inclined to push toward such a result), European states have been less aggressive in pushing for a resumed peace process. Similarly, European states recognize that the U.S. veto of anti-Israel resolutions is firmly back in place. As such, European nation states have not been as quick to advance such resolutions. Furthermore, Europeans have rejected Palestinian efforts to push for a unilateral statehood without the support of the United States. Recently, French President Emmanuel Macron stated that while he is still committed to a two-state solution, he would not advance any peace initiative not supported by both Israelis and Palestinians, or by the United States, and added that he did not believe it was prudent to “unilaterally” recognize Palestinian statehood at this time. The UK Brexit vote in June 2016 for the United Kingdom to withdraw from the European Union has also led the United Kingdom closer to Israel. The United Kingdom is Israel’s third largest trade partner. With the uncertainty that arises from the United Kingdom’s trade status with the European Union that it is divorcing, the United Kingdom has been on a campaign to stabilize and improve trade relations with friendly nations, including Israel and its largest trade partner, the United States. While critical of President Trump’s move of America’s embassy to Jerusalem, British PM Theresa May has been outspoken in her support of Israel in its fight against terrorism and in her disapproval of efforts of nations or companies to boycott or divest from Israel. Israel’s vast natural gas discoveries in the eastern Mediterranean Sea have led to significant partnerships with Greece and Cyprus. Recently, the nations signed a memorandum of understanding to build the world’s longest and deepest underwater pipeline to bring natural gas to mainland Europe via Italy. The need for additional natural gas in Europe and for the diversification of gas providers offers a continued incentive for Israel and European partners to improve relations. Recently, Austria’s newly-elected Chancellor Sebastian Kurz visited Jerusalem. He publicly acknowledged Austria’s participation in some of Germany’s worst crimes against Jews in the Holocaust. Kurz vowed to fight against the delegitimization of Israel in Europe. Just this month, Austria assumed the rotating presidency of the Council of the European Union. Unburdened by decades of failed peace prospects between Israelis and Palestinians since the signing of the Oslo Accords – when Kurz was just seven years old, Kurz’ friendship with Israel may prove critical in advancing Israeli and European relations in the next year. Cultural collaboration between Israel and Europe continues to strengthen. Recently, the Giro D’Italia, Europe’s second largest bicycle race, came to Israel. This was the first time the international race came to a state outside of Europe. Racers stressed how they were welcomed with open arms in Israel, providing a unique counter-narrative to claims of Israeli oppression or apartheid. Similarly, singer Netta Barzilai’s victory in the Eurovision song contest was yet another recent demonstration of Israel’s shared cultural values with Europe. 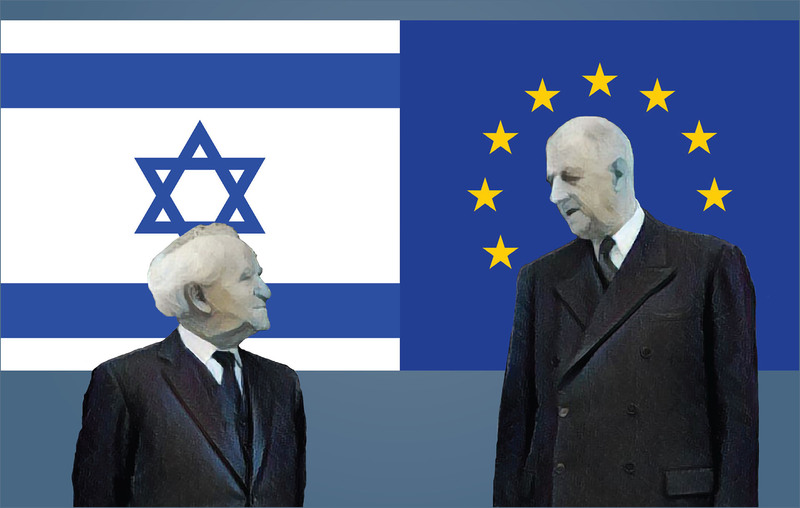 The arrival of the contest in 2019 to Tel Aviv represents a unique opportunity for Europeans to see Israel as a nation that loves culture and feels as a close partner to Europe. Alex Traiman is a veteran journalist and filmmaker, and currently the managing director and Jerusalem bureau chief of Jewish News Syndicate/JNS.org. Traiman has directed and produced award-winning documentaries, including Iranium and Honor Diaries.